Since you’ve decided to make a part of your home an office, this means you’ve probably thought of all advantages and disadvantages of such a move. So, all you are left with now is choosing the right furniture and office design for you. In case there is no officially designated home office that you can use, you should then work towards having a recognized workspace. Create your personal space and have it strictly oriented towards your work, meaning – no more socks stashes in drawers, your kid’s drawings on the walls, or mounds of old receipts on the nightstand. To have this space function in synchronization with your family, you need to think of your family’s habits too and focus on simple organizational solutions that will work even when life gets messy. The key to being happy and productive is embracing your habits. Meaning, if you’ve chosen a place in your home because at the time it looked like the best choice, and you now hate it because it suffocates you mentally and productively, change it! Don’t force yourself to work there. Find the best place in your home that will make you in peace with yourself and your creativity. You can even build a shed in the yard! If not, set up an area in your dining area (or any place you’ve chosen) and take all things you need to work. The former office can be used as storage or it can be turned in whichever other room. When you find a place that suits you, almost half the job is done. It will inspire you to be creative and productive and results will follow. Don’t be discouraged by the fact you don’t have a traditional office. Instead, work with what you have! You can always tuck a desk behind a sofa or under a window. You can use that cabinet you rarely use as your folder storage. This is your area now. Don’t be stressed that bunch of papers, leftover food, coffee mugs, folders is going to pile up. It’s only normal! I know you feel responsible to keep your home clean and everything, but give it a rest. If you are under pressure of having to keep your workspace clean at all times, you’ll do no work at all. Still, you need to have a little discipline. If you are a chaos person, then know where what is in your chaos. Or, set days when you do certain errands. At the end of your previously set work hours, leave some time aside to sort out all important files and folders, mail and other. This will save you from piles of ominous papers and misplaced receipts and letters. The important thing about the system is that it works for you! Nobody else needs to get it, really. If you’ve partnered up with your spouse, this only means expanding your home-work space so it fits both of you. 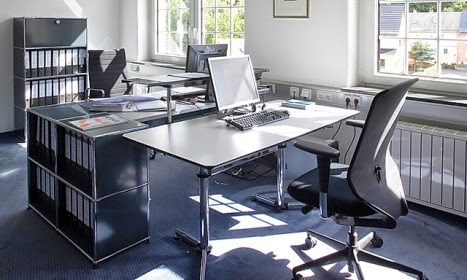 Long desks are a wonderful solution for an office area shared by two or more people. As for storage, use wonderfully decorated boxes that fit the room (décor-wise) and label them with tags of content: “Office supplies,” “Mail,” “Cards”, “Bills”, etc. Looking for a stapler? It’s in the “Office supplies” box! Great news is that the inside of those boxes doesn’t need to be (and often isn’t) all right angles and perfection. It’s a pile of various bits and pieces! But on the outside it’s a neatly organized system that looks good AND helps you find stuff! If you are one of the lucky ones who actually has a spare room and can make it into an office, great! Since this space is just yours, you are at freedom to decorate it the way that’s most stimulating for you! If you don’t want to spend a fortune on picking up new furniture, you can work it out with your current one. All it takes is moving it around a bit so it fits your taste and much needed functionality. If, on the other hand, you want to splurge a bit – do! After all, this will be the space you’ll be spending much time in. Have the walls painted (recommended color is ivory, eggshell, light green/blue, light yellow), pick a great desk that will be cozy to sit at and a new comfortable computer chair that will be good for your back! Choose decorative items to fill the room, something that inspires and motivates you to work. Advice on how to organize, you can check under Step 3.